Copy the files from Nook Tablet Boot Files.zip onto your bootable SDCard. You can boot into CWM recovery by choosing the option “SDC ALTBOOT” or TWRP by choosing the option “SDC RECOVERY”. It appears your work is done here. The last build has been superb. Very fast and stable. Thank you so much for adding on so much life to this tablet! Cheers!!! iamafanof, wich version of gapps should be installed??? Thanks again for your work, I really appreciate. Reboot from TWRP, boot from SDC and animation of the CyanogenMod logo froze after about three seconds of loading. ok, so first-thanks for this, I love my nook for reading, but really would like a full service tablet for working: second-pardon my noobness, am middle-aged and computer inept. That being said, please elaborate on three things for me? 1. does this boot from sd leaving stock nook os on machine, iow, take out card and machine boots as it always has into b&n platform? 2. when you say to “copy *_HD_SDC.zip to sd card, do you mean all versions? 3. for same: do you mean zipped or extracted? again, sorry if my noobness is a bother. The HD is just signature. OK, Thank you. Now to the GAPPS: what do we do with them? I do not see anything in the directions concerning them, but I can’t fathom that you would have provided them simply for looking pretty on the post (though they do look very Christmas-y)..
GAPPS is short for Google apps which is just a package to install Google Play. It’s optional. You install them like you install the ROM. Let me get this clear, you formatted your SDCard with SDFormatter and now you can’t use the card? What brand is the card? There might be something wrong with your card or card reader. SanDisk is the prefer card but beware of the fake one. It is a SanDisk Card #4 16GB. My mistake actually, I indicated that I was unable to go any further than formatting the disk. Actually, I get stuck after trying to image the disk with the boot.img file from the 7zip file. After that is when I am unable to copy any files to the SDCard. I’m sure i’m doing something wrong, but can’t seem to figure out exactly what. Thank you for any help. Format your SDCard with SDFormatter and start over. You do not write the boot.img to your SDCard. You write the *_HD_SDC_IMG.img to your SDCard. When I unzip the cm_acclaim_11.0_01OCT2014_HD_SDC.zip file, I do not see a corresponding img file. The only .img files I see are boot.img, flashing_boot.img and recovery.img. I have looked all through the folders that also are extracted but cannot find the img file you are indicating I should see. That’s the ROM file not the file that contain the IMG that you write to the SDCard, *_HD_SDC_IMG.7z. My apologies. I did misread the filenames. I will try it again. Thank you for your patience. Hi there. Thanks so much for this ROM and all of them in the past! They each bring new life into such an old device. I’m having a problem with the touchscreen on my tablet after flashing the internal. The bottom of the touchscreen (close to the nook button) is a little whacky. I can’t press the back, home, or previous apps buttons, although if I add a 4th button on the right side, I can touch that. The keyboard is also inaccurate on the bottom of the screen (difficulty hitting the space bar, multiple keys hit at the same time, etc…). I tried the touchscreen firmware flasher, going to 10 touch and back to stock multiple times, but this doesn’t fix it [I cleaned the screen too]. When I turn the tablet to landscape everything works as it should (although the same part of the screen is still iffy). Any ideas of what has happened? Potential fixes? Thanks so much! When you open the “Touchscreen firmware flasher” app, what does it state? If it states 10-touch, then you have 10-touch firmware installed. If you want to go back to stock, check the box and click the red button that appears. Remember, 10-touch firmware only works in CM and the touchscreen will be messed up if you are running stock due to different kernel. You need to revert to stock firmware if you are running stock OS. Make a bootable CM SDCard and see what happen. Succulent this rom is so smooth and awesome! Just installed 4.4.4. internal, thank you and whoever helped you, from here until forever! Installed Sep-29 version last night to internal. It works flawlessly after a full day’s use. From CM7 to CM11, this is the best by far. One question: Is it okay to dirty flash the Oct-1 version? Yes and you need to install gapps again. I was in the process of flashing the gapps when I realized that Cyanoboot no longer recognizes when I’m pushing the N button. It is now stuck on booting into recovery every time! Please help with a solution! I apologize for not testing this thoroughly with the kernel and rebooting into recovery. I will fix it in next release. Copy http://www.mediafire.com/download/nzspv2dd5bdluf7/flashable_fix_bootloop.zip onto your SDCard and flash it. I flashed this file and it booted fine. However, after I flashed the latest TWRP (2.8.0.1), I am now not even able to boot into Cyanoboot. It hangs on the n screen. I think I’ll have to start from scratch and use AdamOutler’s Linux sdcard method to reflash back to stock. Latest Omnicom TWRP is 2.8.0.0 which is included in my ROM. 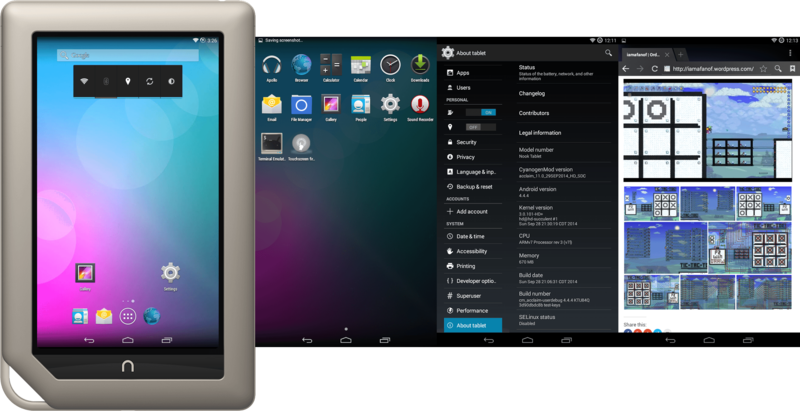 Where is this TWRP 2.8.0.1 you are using? Your case seem like someone forgot to include the Cyanboot header and append it to the recovery, hence no Cyanboot. Make a bootable SDCard and just flash my ROM again. I have a 64 Go microSD card, which I used to install 4.3.2 on my Nook Tablet last year. Everything used to work just fine, until the battery forced the tablet to suddenly shut down. Now I’m trying to install 4.4.4 (SDCard Boot), following the steps you’ve described, but get stucked in the Cyanogenmod boot loop. It correctely starts, but then it shows the cyanogenmod animated logo loading with difficulty before stopping, and reload after a brief white flash. I don’t understand… I’m a little upset because I was waiting this SDcard image since July (thanks for that, by the way ! 😀 ). What brand is your 64GB SDCard? I’ve tested my instructions on a 2GB, 8GB, and a 64GB SanDisk SDCard and they’ve all booted into CM11. Follow the instructions from this post and don’t use any previous image or boot files from my Android 4.4.2 post. When rebooting from CWM Recovery, it will boot into INTERNAL BOOT. When rebooting from TWRP Recovery, it will boot into SDCARD BOOT. Format your SDCard and follow the instructions again. If the SDCard failed to boot into CM11, try it on another SDCard. I’ll try with the version of 1st October, i’ll tell you then if it still doesn’t work. I installed latest TWRP (2.8.0.1), did a wipe, installed 4.4.4 to internal, then installed GAPPS (the modular-mini) to internal. Upon first bootup, it gets stuck in “Unfortunately, Setup Wizard has stopped” loop and I can’t get past it. Any ideas? You have to wipe and start over. You need to boot into CM11 first, then reboot into recovery and install the GAPPS. Perfect. Did that and it worked fine. Thanks much! Can’t wait to try this internal install again. I had the same error as Kevin T and came here to find a solution. Thanks for sharing your CM11 and for the excellent customer service here. Both ROMs have HD in the filename, They look different than the roms for the Nook HD, but the HD in the filenames make me hesitant. All of my rom end with _HD*. They’re my signature. You should know by now “acclaim” is the board name for Nook Tablet, “hummingbird” is Nook HD, “ovation” is Nook HD+, and “encore” is Nook Color. Nook Tablet do not have a Bluetooth chip and OTG USB do not work so please don’t ask about it.